PNG Motors can arrange service at any of our locations: Port Moresby, Lae, Hagen, Kokopo or on your premises. PNG Motors ensures the reliability and safety of your vehicle with our fully trained professional technicians providing the best service standards in the country. We understand that up-time is critical to your operations and our team are trained to get you online as quickly as possible. And to make it even easier for you, PNG Motors offer a FREE pick up and delivery service. Just book 24 hours ahead and ask for our Pick-up and delivery service, it's that simple! Not only can we carry out servicing and mechanical repairs, we have a fully equipped Panel and Paint shop. Set up to do all forms of minor and major repairs. PNG Motors are a certified prefer repairer for PNG's largest insurance company QBE. The parts team at PNG Motors can help you locate any parts or accessory requirements that you may have. Our range and depth of stock means we have the part or accessory you need in stock and can ensure delivery right around the country in order to help keep your goods moving and your business profitable. At PNG Motors we guarantee all service and repairs carried out on your vehicle. 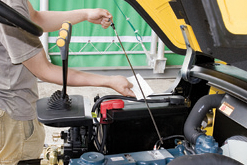 We are committed to keeping your vehicle running as reliability as if it were still new.